I'm supposed to give a talk, in school, on a famous military personality. 1 suggested to my teacher, Miss Eva T. Boycott, that I'd like to give a talk on your glorious, ]heroic life as a pilot during W.W. 1, and she said, "Wlho? VJho's Baron Von Lemon? 1 never heard of ]him! Wlhy don't you give a talk on General George Patton or General Marslhall, or Admiral Halsey'?" 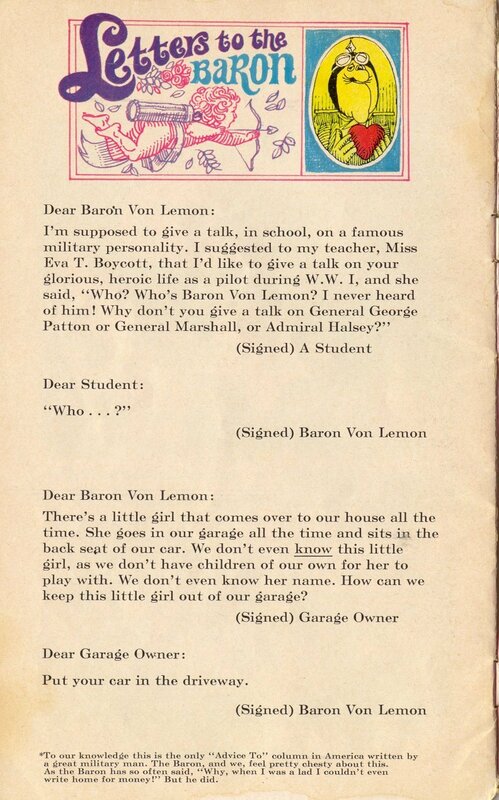 Dear Baron Von Lemon: There's a little girl that comes over to our house all the time. She goes in our garage all the time and sits ig the back sent of our car. We don't even know this little; girl, as we don't have children of our own for her to play with. We don't even know her name. How can we keep this little girl out of our 0,arage? Put your car in the driveway. *To our knowledge this is the only "Advice To" column in Arnerica written by a great military inan. The Baron, and we, fool pretty chesty about this. As the Baron has so often said, "Why, when 1 was a lad 1 couldn't oven write home for moneyl" But he did.